If the characters that populated the JURASSIC PARK franchise (with the exception of Jeff Goldblum’s Ian Malcolm) ever learned from past experiences, there wouldn’t be much of a franchise. These movies aren’t called JURASSIC LET’S STAY HOME INSTEAD. All the JURASSIC films are guilty of this one fact – for us to get the dinosaur thrills that we so desire, we have to watch characters make stupid mistake after stupid mistake to get there. So, we can yell about dumb decisions made, but that’s all part of the fun and key to the enjoyment of these films. That doesn’t make the JURASSIC films immune from criticism, only that until the filmmakers break the mold that they’ve built for themselves, we should expect this kind of behavior from the characters. So, if you can forgive a few lapses in judgment, from the characters as well as the filmmakers, JURASSIC WORLD is quite a bit of fun. My main concern going in was that because of all the shiny new toys that have been built since the first JURASSIC PARK opened 22 years ago, director Colin Trevorrow would want to throw everything and the kitchen sink at the screen. Remember, the first film had very little CGI in it in comparison to today’s blockbusters, and much of the thrill was due to Stan Winston’s animatronic creature creations. JURASSIC WORLD has a lot of CGI, but also quite a bit more restraint than I was expecting. Trevorrow also charms the hell out of the audience, and I was impressed that even after four JURASSIC films, and all the spectacle that we’ve seen in cinemas since 1993, these films still have the capacity to thrill us. You may not even notice, as you enjoy all the dino action and thrills, that Rick Jaffa, Amanda Silver, Derek Connolly, and Trevorrow’s script is all over the place. JURASSIC WORLD’s strengths lie in its spectacle, not in its logic. At times, the writing feels engineered simply to get us from one setpiece to another, without expanding on the characters or the story. That would be more of a problem if the setpieces weren’t as spectacular as they are. Imagine if the first JURASSIC PARK had managed to include the trailer sequence from THE LOST WORLD and the aviary sequence from JURASSIC PARK III and you have some idea of how much gets shoved into JURASSIC WORLD. That’s not to say that Colin Trevorrow can orchestrate his action with the skill of Steven Spielberg (or even of Joe Johnston, at least right now – JURASSIC WORLD is only his second theatrical film) – very, very few directors can. But Trevorrow does well enough for the film; he knows how to build the tension, and doesn’t rely too much on the effects technology to make things exciting. There are even a few moments of creature puppetry, but the late Stan Winston, and his contributions, are sorely missed. Winston kept JURASSIC PARK grounded, and although CGI was still very young back in 1993, Phil Tippett and Stan Winston’s collaborations resulted in the most realistic portrayal of these creatures to date. And that includes JURASSIC WORLD, unfortunately. The dinosaurs are impressive, but there’s still something to be said for solid live-action animatronic creature work onscreen. The eye can just tell. There’s a weight to what Phil Tippett and Stan Winston did that feels lacking in JURASSIC WORLD. But Colin Trevorrow still makes the dinosaur action exciting, especially when we see the dinosaur aberration Indominus Rex, a hybrid genetically created by InGen to excite and frighten parkgoers who, after several years of seeing dinosaurs in the flesh, are becoming blasé about the whole affair. It’s up to park manager Claire Dearing (Bryce Dallas Howard) to figure out how to get audiences excited again, and so with the encouragement of park owner Simon Masrani (Irrfan Khan), and the scientific brilliance of Dr. Henry Wu (B. D. Wong, the only returning cast member from the original film), Indominus Rex is created, and Claire enlists the aid of raptor wrangler Owen Grady (Chris Pratt) to open this new attraction as soon as possible, despite Owen’s protests that Indominus may be too dangerous. 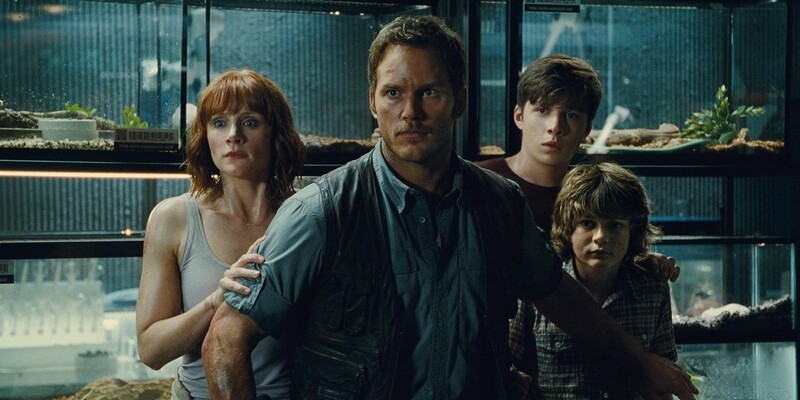 Things happen as they must, and soon everyone at Jurassic World is fighting for their lives, including Claire’s two nephews Gray (Ty Simpkins) and Zach (Nick Robinson). The raptor training works, mostly because Chris Pratt makes it work, with his earnest nature, his humor, and his commitment to the verisimilitude of the movie. 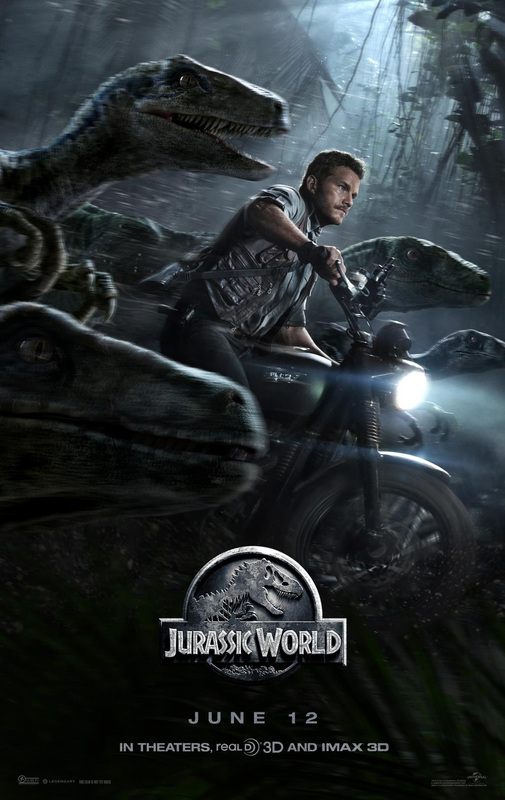 We believe it because Owen Grady believes it, and I loved the wild nature of the raptors this time out – they respect Owen, but Owen never forgets that these are animals that would tear him to pieces if he ever showed any weakness. Less believable is Vincent D’Onofrio’s head of InGen security Vic Hoskins, chewing scenery like, well, a raptor would. Hoskins has a plan for these animals, and they don’t include showing them off in amusement parks. The other performances range from decent to “Which dinosaur gets to eat this person”, and although Bryce Dallas Howard has been good in other films, here, once things start going south for the park, Claire becomes just another screaming character in distress. Sam Neill, Laura Dern, and especially Jeff Goldblum feel missing here, but that’s not JURASSIC WORLD’s fault – it’s just that those characters were so memorable in the first film and JURASSIC WORLD’s other actors, other than Pratt, can’t reach that level. People who remember John Sayles’ “raptors with guns” JURASSIC PARK script will find that some of that has found its way into JURASSIC WORLD, although heavily changed. But the sequences with the raptors are thrilling and fun, and expand the audience’s knowledge of these creatures without making them forget just how scary they are. The Indominus Rex is also scary, mostly because, like in ALIEN, we can never be sure what to expect from it. Strikingly intelligent with abilities so far unseen in a dinosaur, Indominus Rex isn’t just a rampaging animal, but seemingly a creature with a purpose. 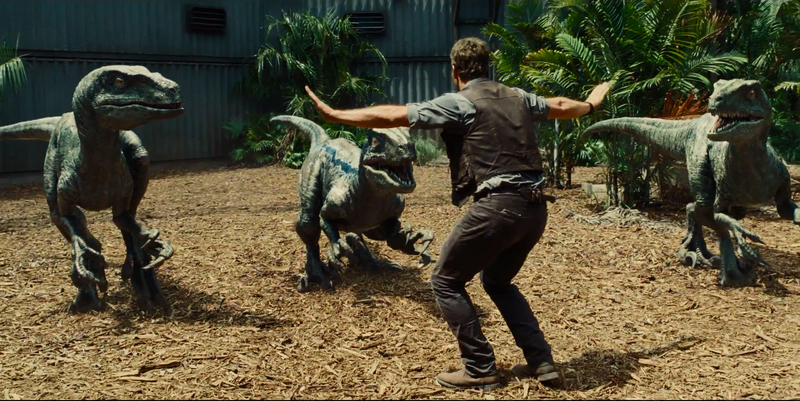 There will obviously be more of these films, and I imagine JURASSIC WORLD will do very well. But I look forward to when these films expand outside of the park setting, and try something new. JURASSIC WORLD cleverly turns the first film on its ear, and savvy viewers will note that the film could also be an allegory for summer moviegoing in general. Sometimes bigger isn’t necessarily better. JURASSIC PARK knew its limitations, and how to use what it had in the best, most impactful ways. JURASSIC WORLD, to a lesser degree, knows that too – although the trailers show a lot, they also hold back quite a bit from the third act, which is explosively entertaining and has some of the craziest dinosaur imagery since, well, the first film. Yes, a lot of the characters are simply there to be put in danger, but the danger is really well done. Much like the rides that JURASSIC WORLD emulates, the film is fun to watch as we get thrown around a bit in the rollercoaster, and when it’s over we may be embarrassed as to how we reacted, but that won’t keep us from getting back on. 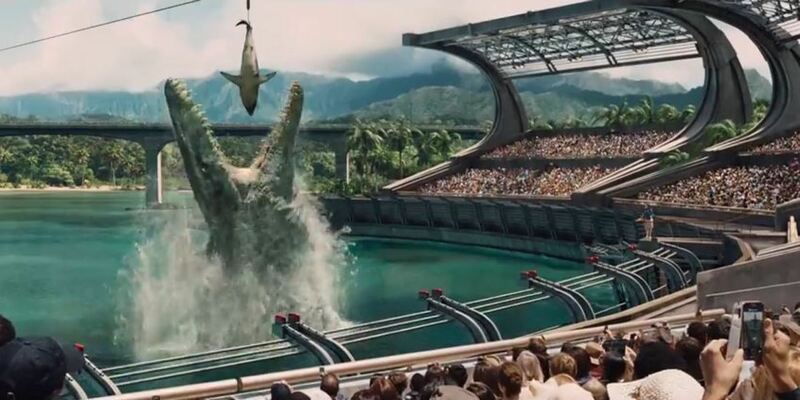 JURASSIC WORLD is entertaining, and does exactly what it’s engineered to do. Just try not to hold the fact that it’s nowhere near as good as the first film against it.